FAYETTEVILLE, Ark. 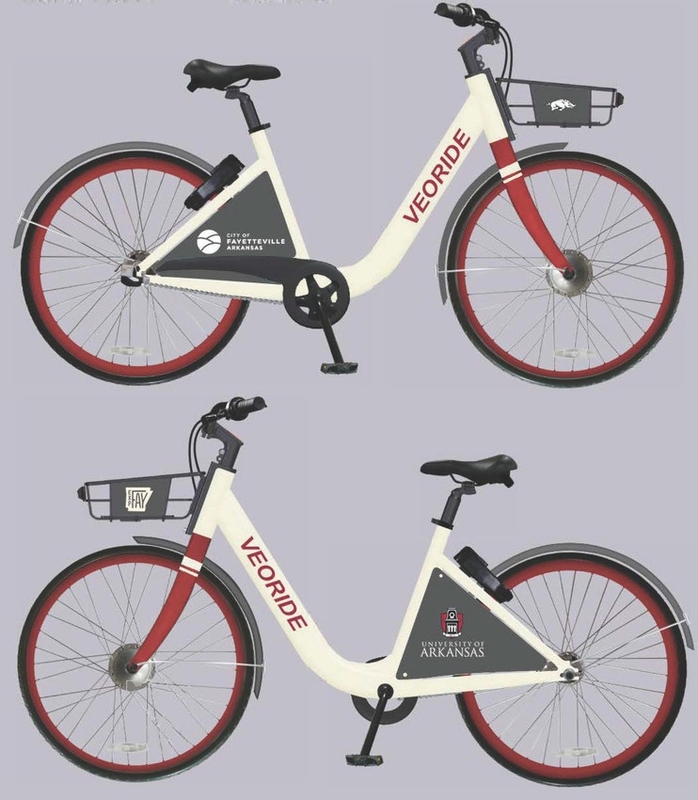 – Everyone in the U of A campus community will soon able to join a mobile app-based bicycle-sharing program, thanks to a partnership with the city of Fayetteville and VeoRide, an Indiana-based bike-share service. This will be the first bike-sharing program in Northwest Arkansas. The Fayetteville City Council approved a contract with VeoRide Inc. on Tuesday, Aug. 7, to be the exclusive provider of the city’s bike share program. VeoRide was founded at Purdue University in West Lafayette, Indiana, and is available in nearly 20 cities, including Austin, Texas; Lawrence and Pittsburg, Kansas; and Champaign, Illinois. The bike-share program is planned to launch in September. More details about the program will be announced later. VeoRide works through a mobile app, similar to ride-share programs such as Uber. It will allow users to locate, reserve and unlock available bikes at designated areas throughout the city. Riders must provide their own helmets. The city, university and Experience Fayetteville have partnered to sponsor the system, offering the bike-share service for free during its first two weeks and then keeping the standard cost lower for all users. After the introductory period, riders will pay 50 cents per 15-minute ride. Unlimited usage is also available through monthly and yearly memberships. The Fayetteville fleet will consist of 340 bikes, including 50 e-bikes. Most of the fleet will be uniquely branded featuring Razorback colors and logos of the university, city and Experience Fayetteville. VeoRide is a dock-less bike-sharing system, so both pickup and dropoff of the bikes take place at designated areas. The bikes cannot be operated unless unlocked through the app, and the bikes can operate only within a certain radius. More information on VeoRide is available online.